Right now 210 guest(s) and 0 registered member reading us. Post your Halloween nail art on Instagram and get featured by a famous brand! Halloween is almost here and we know you are already thinking about spooky designs for your customers. Post your best works on Instagram and become famous! 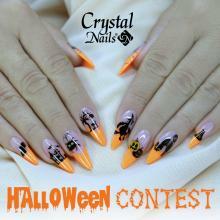 A team of Crystal Nails champion nail professionals will choose 3 winners! If you win, your picture and name will be shared on the Crystal Nails Official Instagram and the Crystal Nails USA Facebook page! We have more than 100 thousand followers so you and your design will be famous! The submission deadline for the game has expired. Please, Choose another game!